Vietnam House Restaurant on Grove Street is a favourite restaurant for the OH and I. We even went there for dinner to celebrate our first anniversary last year! So having been going there many times since they first opened in 2011 before I became vegan, how do you know what to eat when you’re now vegan? The restaurant expanded in the last few years to include the next door shop space, at first the restaurant only encompassed the main space you see as you enter the front door. The family run business offers tasty Vietnamese food (mainly flavoured with herbs and lemongrass) that has done well over the years. There was another Vietnamese restaurant previously open on Dalry Road just off Haymarket station, but I went once to meet friends and noticed they give you big bowls full of over salted broth and not much noodles and was quite disappointed in the quality of the food served. I was not surprised to hear that restaurant is no longer in business. 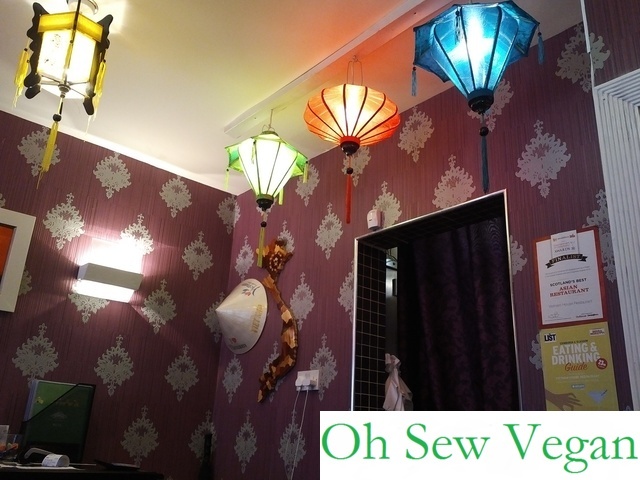 The Vietnam House has done so well, that they also have a gallery just opposite the tram station at Haymarket, Vietnam House Gallery, where you can purchase artwork, hand painted by the restaurant owner’s mum. 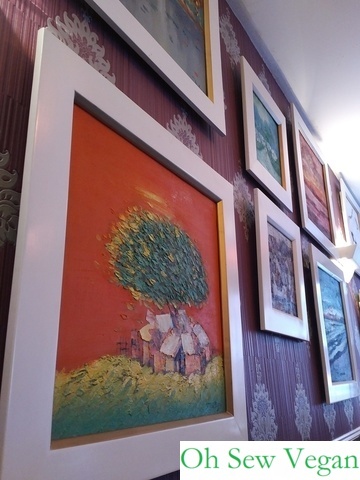 The same artwork graces the walls of the restaurant which are also for sale. All the waiting staff that we’ve met each time we visit the restaurant has been very friendly and are happy to answer any dietary requirement questions you might have. I phoned up to check on the broth used in the pho (traditional Vietnamese dish consisting of flat rice noodles in broth) and the staff that answered the phone was very helpful and checked details for me when she wasn’t too certain. 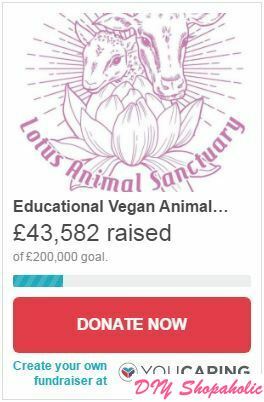 Veganism isn’t so much a concept that is widely known in Asian culture because, as is common in Western cultures, meat and eggs are commonly in each meal unless you were a practicing Buddhist. 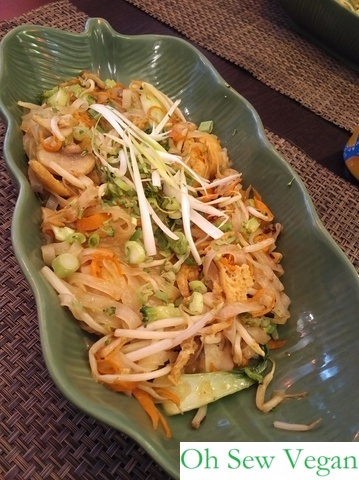 Some Asian restaurants may therefore not be aware of what being vegan means. Be prepared to phone them beforehand to let them know what you can and can’t eat and to check that this won’t be an issue. Usually in Asian restaurants, this won’t be a problem, but it’s best to check as some restaurants may have dishes pre-prepared in bulk. Everything at Vietnam House is freshly prepared so you’ll need to be a bit patient while the chefs create wonderfully tasty food for you. I had phoned them in advance to check about the pho, but I let the waiting staff know when ordering as well that I don’t eat egg and they said eggs shouldn’t be used in my dish, but were quite happy to let the kitchen know just in case. When ordering the vegetarian pho, make sure to specify you want the vegetable broth. When we first visited the restaurant, you could order the rolls with either chicken or prawn, but they’ve since expanded their menu to cater to vegetarians and vegans as well. The tofu seems to be marinated and isn’t quite as soft as I expected and it was quite tasty. The tofu evidently takes up less space than the chicken and prawn, but it doesn’t detract from the flavour at all. 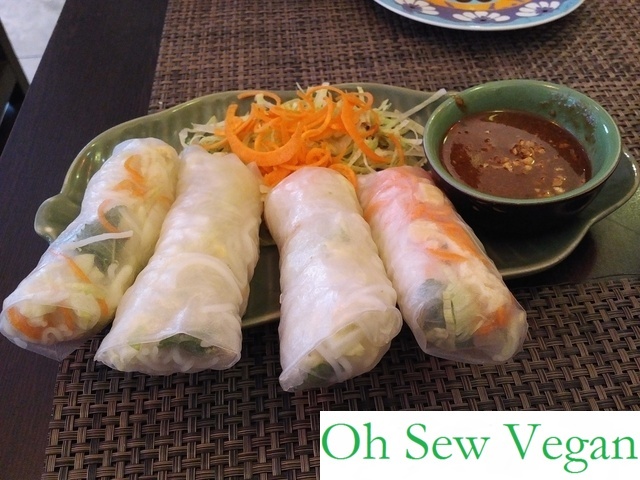 The rolls are still jam-packed full of flavour from the mint and vermicelli rice noodles and when dipped in their tasty peanut sauce (if I could eat the sauce on its own, I would, if it didn’t look strange in public!) you would hardly notice the difference. For the main course, there are a lot of choices to choose from. When ordering the vegetarian pho (pho chay) or spicy vegetarian vermicelli in soup (bun chay), make sure to specify you want the vegetable broth, otherwise they serve it with beef broth. Most (if not all) of their creamy curry dishes (like their creamy curry, spicy curry and braised vegetables) use coconut cream, but just ask the waiting staff to make sure. The Lotus Rice (when ordering the vegetarian option, xoi chay) is also suitable for vegans. The OH had ordered the house special fried noodles before with prawn and it looked very tasty, but I used to always order the pho. With being vegan, I decided to give the fried noodles a try as I wanted something different for a change from pho (noodles in soup) with fresh vegetables. The OH ordered the fried noodles with prawn and it was evident from when our noodles arrived that it seemed he had more noodles, but I believe that it’s only because of the size of the prawns that bulked it out. The rich homemade sauce as very nice, it reminded me of soy sauce with a slight sweet flavour to balance out the saltiness of soy sauce without being overpowering. I’ve been to Chinese restaurants where they made the plum sauce so thick, it was almost sickening and you couldn’t really enjoy the dish. This sauce was definitely done right and I enjoyed every bite of my noodles, and the tofu was in no way a deterrent for me either. I would happily order the fried noodles again if fried food wasn’t so bad for my complexion! Having an intolerance to certain fruits meant the fruit sorbets were not an option for me. I asked about the Vietnamese dessert and it sounded intriguing so I decided to give that a try. I’ve never heard of basil seeds before nor tried them so was interested. 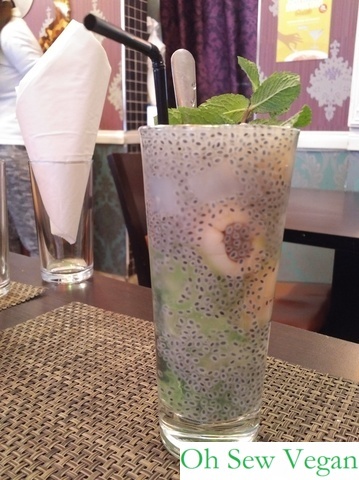 It’s like sago on the outside with a crunchy seed in the middle and while I’m not a big fan of lychee (I ate too many of them growing up), I did like the slight sweet taste of the drink with the basil seeds and coco de nata. There is also the option to order the Vietnamese Rainbow Drink with mung bean, kidney beans, gelatinous seaweed, coconut milk and ice. A lot of Asian drinks sound strange, but I promise the combinations do work. We used to drink what we called Red Bean Ice in Hong Kong which consisted of cold sweetened soy milk in ice with red beans. Vietnam House Restaurant can be found on 1-3 Grove Street, EH3 8AF and is open daily from 11:00am to 10:00pm daily. For any enquiries or to make a reservation, call 0131 228 3383. Do you have any favourite restaurants in Edinburgh (vegan or with vegan options) that you’d like me to review on my blog? Let me know in the comments below!